I was at the gas station when I spotted a dime in the wintery slush. I bent over and picked it up, getting my leather glove not just wet but dirty. I threw the dime in my bag and forgot about it. I had owed my local library 50 cents in overdue fines but only had four dimes when I paid the fine the day before, leaving a ten cent balance. That afternoon I paid off the remaining twenty percent of the fine with a dime. Not the dime I had found, but another dime. 20% is huge when one considers it can be paid with found money. The value of found money. The next day I was a dime short on a small purchase. Digging around in the coin drawer of my car I found a dime to complete my transaction. This also was not the dime I had found. 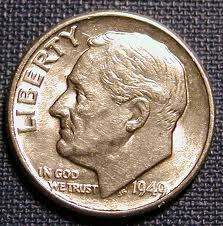 But I marveled at how a found dime added value to what I needed, even if it wasn’t the exact same coin. Finally, I pulled out that found dime, the one that had dirtied my leather glove and looked at it. It looked like a normal dime; just maybe a little old. It’s date was 1949. Coins of this vintage can have some value – beyond ten cents so I looked it up. Its value is listed as $15. Not a huge find. Although $15 is nothing to ignore. It is the percentage of value that is amazing. Ten cents turns into $15 dollars. Better yet, a dime that was not mine. The dime belonged to and was lost by someone else. I just happened to see it and being the cheap skate I suppose I am, I picked it up. I did not think about paying my library fine or needing an additional ten cents. Nor did I think about its unknown numismatic value or the cost to clean my leather glove. 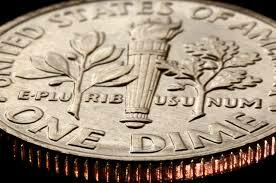 Sometime ten cents is more valuable than one thinks. This entry was posted in Life and tagged 5 cents, coin, coins, collect, collector, Dime, dollars, money, numismatic, pennies, Roosevelt Dime, ten cents, value. Bookmark the permalink.